One of the more rare of the Were-Beings, they are mostly found in wilderness areas like the huge open lands of the Canadian wilderness. To a lesser extent, they are found in places such as the black forest. Were-Lynx are found rarely in Urban areas but can even be found there. Being that Lynx has not been hunted like some of the other species, they have an easier time hiding in the wild than many other species. Those who live in the human world tend to take jobs that allow them to live in the wilderness. 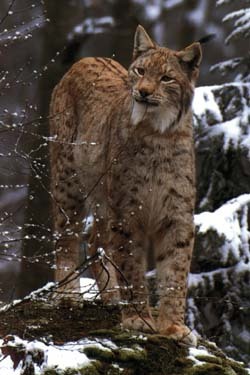 Were-Lynx are mostly found in North America and Europe. Were-Lynx include Bobcats, Marbled Cats, and other members of the Lynx family as well. While less stronger then other Were-Cats, they make up for this by being more agile. Were-Lynx tend to be fairly solitary and tend to only group together in mated pairs. When a young Were-Lynx is capable of fending for herself, she normally leaves and makes her own life. They are not particularly violent and as such do not have the bad reputation that were-wolves and many of the larger were-cats. The were-lynx are known as tricksters but do not have the reputation that were-fox have. Like most of the less violent were-creatures, the were-lynx are deeply concerned with saving the Earth. Like were-foxes, those in human society are likely to become involved with environmental groups and like the foes are usually not members. They tend not to join the various were creature groups and prefer to be by themselves. Attributes: I.Q. 3D6, M.E. 3D6, M.A. 4D6, P.S. 3D6 (never less than 12), P.P. 5D6 (never less than 20), P.E. 3D6, P.B. 4D6, SPD. 4D6 (human) / 5D6 + 20 as a lynx, human speed + 3D6 in lynx-thing form. Horror Factor: 8 as humanoid lynx-thing. The horror factor does not apply to human or lynx form. Natural Armor Rating: Special! Like the vampire, the werebeast is invulnerable to virtually all non-magic weapons, including energy weapons, explosives, bullets, fire, wood, and poison/drugs. However, also like vampires, werebeasts are vulnerable to ordinary silver. Weapons that have at least a 50% silver content inflict double damage! Thus a silver plated dagger, which normally inflicts 1D6 S.D. damage, inflicts 2D6 directly to the monster's hit points/S.D.C. Although werebeasts posses bio-regenerative powers, they are nothing like the vampire's so being bludgeoned or stabbed by silver can kill the creature. Also, the werebeast is vulnerable to magic and psionics as well as the natural attack forms of other supernatural creatures. Wolfbay will hold all werebeasts at bay, like garlic does a vampire. Powerful explosions or impacts won't do damage but may knock the creature down or stun it. 301+ : 100% knocked off feet and stunned! Lose all attacks that melee round. P.P.E. : 2D4x10+20 (+P.E.) I.S.P. : 4D6 + M.E. Natural Abilities: Speak while in animal shape, prowl 90%, swim 60%, track by smell 60%, nightvision 300 feet, and bio-regeneration: restores hit points at a rate of 1D6+4 H.P. an hour, climb 85%/75%, land navigation 90%, wilderness survival 90%, acrobatics 60%, keen color vision and hearing, 2 secondary skills, +3 to perception. All werebeasts can communicate with their related animal type (for example, werebears with bears) while in any of their forms. Though they do not possess supernatural strength, their hand to hand attacks do cause damage to those beings harmed only by magical means. They suffer from wildlust with the same percentages as Were-Panthers. Shape Shifting Abilities: The metamorphosis takes about 15 seconds and there is no limit to the number of times the creature can perform a metamorphosis or how long he can maintain that particular shape. Transforming is painless and does not restrict the werecreature from acting. The three shapes are human, beast, and a man-beast hybrid. Magic: Summon and Control Cats, Repel Animals, Tongues, Chameleon, Sense Evil, Sense Magic, and Invisibility: Simple. Combat: Plus 2 attacks in hybrid or animal form. Bonuses: +3 on initiative, +2 to strike and parry, +4 to dodge, +4 to pull punch, +4 to roll with impact, +6 to save vs. horror factor, +2 to save vs. psionics, +2 to save vs. magic. Damage: * add bonus to damage from high P.S. NOTE: All claw and bites inflict full damage to the H.P. of vampires and other werebeasts. Average Life Span: 400 years. Enemies: Those who would hunt them and vampires. Allies: Rarely join forces with others, their trust is difficult to earn although not impossible and very loyal when friends are made. Size: 4.5 ft to 5.5 feet tall in human and hybrid form, slightly larger than a normal lynx in beast form. Weight: Average human of medium to slightly stocky build. Few were-lynx are very thin or really fat. In Lynx form are only slight larger than a normal Lynx. Appearance: As human, generally have light brown hair. In Lynx and Man-Lynx form they have generally light brown fur with grey or dark spots or stripes depending on breed of lynx they are. Generally the underbelly is white and tail is black tipped. Habitat: Virtually anywhere. Mostly found in North America and Northern Europe. Optional: Instead of just Hit Points, the character can be given both S.D.C. and hit points and have both only damaged by weapons that can hurt were beings. This increase is especially useful in Nightbane where most creatures can inflict damage to them in hand to hand. In that case make base S.D.C. : 3D6+20. Based on Work by Steven “Conan” Trustrum (strust@interlog.com).